The artist-and-labels-versus-YouTube crisis is going to run and run, even if some form of settlement is actually reached…the divisions and ill feeling run too deep to be fixed solely by a commercial deal. What’s more, a deal with better rates won’t even fix the underlying commercial problems. Music videos under perform on YouTube because they don’t fit YouTube in 2016 in the way they did YouTube in 2010. The 4 minute pop video was a product of the MTV broadcast era and still worked well enough when online video was all about short clips. But the world has moved on, as has short form video (in its new homes Snapchat, Musical.ly and Vine). Short videos are no longer the beating heart of YouTube viewing and quite simply they don’t make the money anymore. This is why music videos represent 30% of YouTube plays but just 12% of YouTube time. If record labels, publishers, performers and songwriters want to make YouTube pay, they need to learn how to play by the new rules. And to do that they need work out what to do with ‘15’. The recorded music industry gets radio, and it is beginning to get streaming. Both are all about plays. Each play has, or should have, an intrinsic value. They are models with some degree of predictability. But YouTube does not work that way, which is why the whole per stream comparison thing just does not add up. In MIDiA’s latest report ‘The State Of The YouTube Music Economy’ we revealed that YouTube’s effective per stream rates (that is rights holder revenue divided by streams) halved from $0.0020 in 2014 to $0.0010 in 2015. YouTube pays out as a share of ad revenue (55%) not on a per stream basis. So when the value of its ad inventory goes down (due to factors such as more views coming from emerging markets with weaker ad markets) the revenue per stream goes down too. This is something the labels can do little about, though an increased revenue share will soften the blow as YouTube globalizes. YouTube serves its in-stream video ads (the most value ad format) on a time-spent basis, not on a per-video basis. Our research found that the average number of video ads per hour of viewing comes out at about 4. That means if you have 15 minute videos (like many YouTubers do) you will get a video ad every play. But if you have 3 or 4 minute pop videos you may only get 1 video ad for every 4 or 5 plays. Which means 4 or 5 times less video ad revenue. In fact, our research revealed that just 26% of music video views have video ads. This is the underlying issue the industry needs to address, and unlike global ad market dynamics, this is something it can indeed fix. This is where the magic number 15 comes in. Right now music video sits in the same 3-4 minute slot it has done so ever since MTV said it wanted videos that length. Yet video consumption is now polarized between the 15 second clip on lip synch apps like Musical.ly and Dubsmash and 15 minute YouTuber clips. Falling in between these two ends is revenue no-mans land. As I have written about before, labels and publishers need to figure out how to harness the 15 second clip as an entirely new creative construct and shake off any old world concepts that this is actually anything about marketing and discovery. It is consumption, plain and simple…it just happens to look unlike anything we’ve seen before. And before you cry out ‘but this stuff will cost so much more to make’, it doesn’t have to if more is made out of current assets and processes. For example, ensure that one of the support crew has a handheld camera to film some shoulder footage for reportage. The whole thing about YouTube is that it doesn’t have to be super high production quality, in fact the stuff that does best patently isn’t. YouTube videos that work best are those that are an antidote to the old world of inaccessible glamour. If you really want to do things on the cheap, simply splice three music videos together into a single long form video (e.g. tag 2 older tracks onto the new single). Doing so will nearly treble the video ad income. And before you think this isn’t what audiences want, ask Apple about ‘The 1989 World Tour LIVE’ and Tidal about ‘Lemonade’. And (yes another ‘and’) if you can’t get your head around the inescapable need for a completely new music video construct, just think about it this way: 15 minute videos will make you 5 times more video ad revenue. This really is a ‘no brainer’. As a final piece of evidence (not that it is needed), cast your mind all the way back to 1982, to Michael Jackson’s landmark video ‘Thriller’. A 13:42 video that is widely recognized as one of the all time music video greats that has also racked up 330 million views on Vevo. So you could say the case for 15 minute video was already made a quarter of a century ago (thanks to MIDiA’s Paid Content Analyst Zach Fuller for pointing that one out). The 4 minute music video is dead, long live the 15 minute music video. For more detail on our ‘State Of The YouTube Music Economy’ report check out our blog. You can also buy the 25 page report with 8 page data set here. This is the second in a series of YouTube generation posts. See the first one here. A couple of weeks ago I wrote about Generation Edge – the under 16 millennials – and how they are driving an entire new subculture of YouTube stars that throw the traditional fandom rulebook out of the window. One of the intriguing paradoxes (or at least apparent paradoxes) is how a generation of native YouTube stars can create both vast audiences and revenue while for music artists YouTube is simply a place to build awareness and probably lose net revenue due to YouTube streams cannibalizing paid streams. So how can the model both be broken (for music) and yet buoyant for native YouTuber creators? Compare and contrast the biggest earner in music with the biggest earner on YouTube. 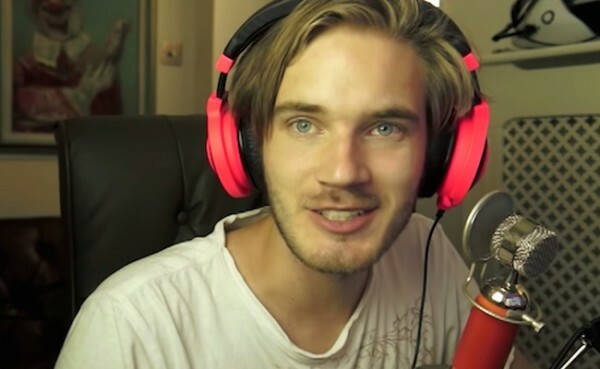 Taylor Swift netted $39.7 million in 2014, compared to $7.4 million for PewDiePie. Seems like a slam-dunk for music right? Except when you start digging a little all is not quiet what it seems. Swift’s numbers are gross revenue so include the revenue earned by everyone else (record labels, promoters, ticket agencies, venues etc.). Let’s say she earns a third of that income which would equate to $12 million (and before anyone suggests it should be higher given her relationship with her label Big Machine ¾ of her revenue came from live in 2014). So suddenly the difference doesn’t look quite so big. Then consider that PewDiePie’s $7.4 million refers just to his YouTube ad revenue and doesn’t take into account his live appearances income or his merch revenue. And, perhaps most importantly, the cost of earning that income was negligible. PewDiePie’s audience is right there on YouTube and his videos are home made. The cost of production, distribution and marketing are close to non-existent. The exact opposite is true of breaking a release like Taylor Swift’s ‘1989’. It’s no secret that most big labels lose money on lots of their bigger front line releases, relying upon a few massive successes and the steady income from back catalogue to pay the bills. PewDiePie just passed 10 billion views three weeks ago and has 39.9 million subscribers – that’s one for every (gross) dollar that Taylor Swift earned in 2014. Anyway you look at it, those numbers are big. Game Of Thrones, which can lay claim to being one of the mainstream media success stories of the moment, has clocked up around 700 million total views globally over the course of 5 series. And while traditional media apologists will argue that you cannot compare a PewDiePie view with a GoT view try telling a PewDiePie subscriber that their viewing is somehow less worthwhile because it is more than weekly and doesn’t come from a traditional TV set. Taylor Swift of course also has a pretty hefty YouTube / Vevo presence too, with 16.5 million subscribers and 6.3 billion views. But while she has 20 videos available PewDiePie has nearly 2,500. And therein lies one of the key differences. PewDiePie lives on platforms like YouTube and Twitch. His focus is making content regularly for his audience and engaging directly with them. YouTubers typically make multiple videos every week and often multiply that across multiple different channels. Try squeezing that in around touring, recording, writing sessions, media work etc. Swift, unlike many big pop artists, also knows how to do the native YouTube thing too and has had her own, non-Vevo, YouTube channel since 2006, posting 136 videos there to date. But in stark contrast to her Vevo channel Swift has just 1.4 million YouTube channel subscribers. So even one of the most YouTube-centric of pop artists that also happens to be one of the biggest pop acts on the planet right now simply doesn’t have the time, positioning nor content to compete with a shouty gamer from Sweden. So where does all this leave artists and YouTube. Unless bands want to ditch the guitars and start doing Minecraft commentary videos, becoming a full-on native YouTube creator simply isn’t feasible for most artists. But there absolutely is middle ground between the dominant focus on seeing YouTube simply as a marketing channel for music videos, and the native creator route. Part of the solution is seeing YouTube for what it actually is. It is not a video platform, or a marketing platform, it is one of the most important destinations for Millennials of all ages, especially Generation Edge. It is at once a social network, a TV network, a fun place to hang out, a discovery destination, a place where they can simply be themselves and feel connected. YouTube is all of that and more. In fact the breadth and depth of content means that it is everything to all people. Treating YouTube simply as a marketing channel not only underplays its potential but it also completely misses what it means to your target audience. PewDiePie, Zoella, Stampy, Michelle Phan are all so successful because they speak directly with their YouTube audiences in an authentic voice that communicates that it is the here and now that matters. That it is about the moment not simply an attempt to try to get the viewer to go somewhere else to do something else. Authenticity is a priceless commodity and native YouTube creators have it in spades. That is the currency of the YouTube generation. 2014 has been a dramatic year for the music industry and may prove to be one of its most significant. The brief history of digital music is peppered with milestones such as Napster rising its head in 1999, the launch of the iTunes Music Store in 2003, Spotify in 2008. The 2014 legacy looks set to be more nuanced but equally important: it is the year in which streaming started to truly transform the music industry. The significance though lies in how the music industry is responding. With download sales tumbling, royalty rates still being questioned, and Taylor Swift’s hugely publicised windowing, the music industry is taking a long hard look at what role streaming should play. Spotify and Soundcloud will find themselves in the cross hairs, but there is also a case for redefining YouTube’s remit too. Swift’s windowing move centred around free streaming. If Spotify had been willing to treat the free tier as a separate window from its paid tier, the odds are it would have got ‘1989’. Spotify’s argument that weakening the free tier could affect their ability to convert is logical. But ultimately the purpose of the free tier is to persuade people to pay to stream, not to deliver a fantastic free experience. I first made the case for windowing back in 2009 and I remain convinced it will be crucial to long term success. By playing an all-or-nothing negotiating game freemium services risk being left with the latter. And it would be a tragedy if freemium got thrown out with the windowing bath water. Windowing will quite simply make free tiers more palatable. Windowing can drive huge success. Look at Netflix: with 50 million subscribes gloably Netflix has the traditional broadcast industry running scared yet is far more heavily windowed than Spotify – how many new movies do you find on Netflix? But the core problem is that Spotify does not exist in a vacuum. While Swift windowed Spotify her videos stayed on YouTube and Vevo. Unless YouTube is treated with a similar approach to other free services then any windowing efforts will simply drive more traffic to YouTube rather than drive more sales or subscriptions. 5 years ago a YouTube stream could be seen as driving sales, now a YouTube stream drives another YouTube stream. Among the Top 10 fastest growing YouTube channels (in terms of views), half are music. More people are streaming more music on YouTube than ever. The reason YouTube remains untouchable has much to do with the fact labels still see it as a promotional vehicle despite the fact it has become a fully fledge consumption platform. Without doubt YouTube plays the discovery role for youth that radio does for older generations. But it is also the end point for youth. So what is the solution? Simple. If YouTube is the radio equivalent for youth, make it look and feel more like radio, not like Spotify premium with video. Instead, make YouTube look like Pandora with video. If YouTube is all about promotion then swap out unlimited on demand mobile plays for DMCA compliant stations. Let any user search and discover a new song but once they have discovered it the next few music videos are automatically selected related videos. That is at the core of what makes a streaming service additive versus substitutive. This is why Pandora stands out as a complement to ‘sales’ revenue and why YouTube no longer can. If YouTube’s core value to the music business is still discovery then this approach is how that role can be protected without damaging the ability of subscription services to proposer. Now of course, YouTube has its own subscription service too in the form of Music Key, which is great: YouTube is a hugely welcome addition to the subscription market. But this does not mean YouTube music videos should be free on demand to all. Only 3% of UK and US consumers say they would pay for Music Key (and consumer surveys typically over report on intent to purchase). Instead, YouTube’s free on demand music videos should be only available for users that register for Music Key. This would be Music Key’s freemium base, not the entire installed base of YouTube users. With on demand free music it is all about the conversion path: how many of those consumers that listen for free are likely to pay. With YouTube’s 1 billion users it is a tiny per cent so there is little business rationale for letting them take the Ferrari out for a test drive when they are only ever going to get the bus. Is 9.99 too expensive for most free music users? Of course it is. Should PAYG options be added in to the mix? Yes, absolutely. But none of those will work unless the music industry takes a consistent and fair approach to freemium. Turning YouTube into a video enabled Pandora is clearly a controversial proposal and it will have huge opposition. It may even cause some meaningful disruption in the mid term, but unless equally meaningful change is made the music industry will remain locked on course to a future in which subscription services will never be able to realise their full potential. The removal of all of Taylor Swift’s albums from Spotify and other streaming services is sending minor shockwaves through the music industry. Swift’s label Big Machine has long adhered to a streaming windowing strategy and there is pretty compelling evidence that the approach has paid dividends. Swift’s ‘1989’ is not only on track to be the only million selling US album this year it is also set to have the highest ever first week album sales for a female artist, again in the US. No mean feat considering how much album sales have tanked. While it is impossible to prove the exact degree of causality, it would be fatuous to claim that windowing had done anything less than not hurt those sales. Windowing is an issue that refuses to go away but is a natural effect of the transition phase we are in. Some artists and labels were just as fearful of iTunes in the 2000’s as they are now of Spotify. Heck, it took the Beatles seven whole years to finally license their catalogue. Right now there is still a very sizeable music sales marketplace. 79% of all recorded music revenue in 2013 came from sales. So it is understandable that some labels want to protect that Golden Goose as long as they can. And it is little compensation for labels that declining music sales are made up by increased live revenues. In even the most label friendly 360 deals music sales are still the core revenue stream. However the shift to consumption models is an inevitable process. In the short term expect copy cat actions. Labels and artists will see the run away success of ‘1989’ and conclude that windowing played a key role. This may hurt Spotify just as it was beginning to feel good about proving its model. 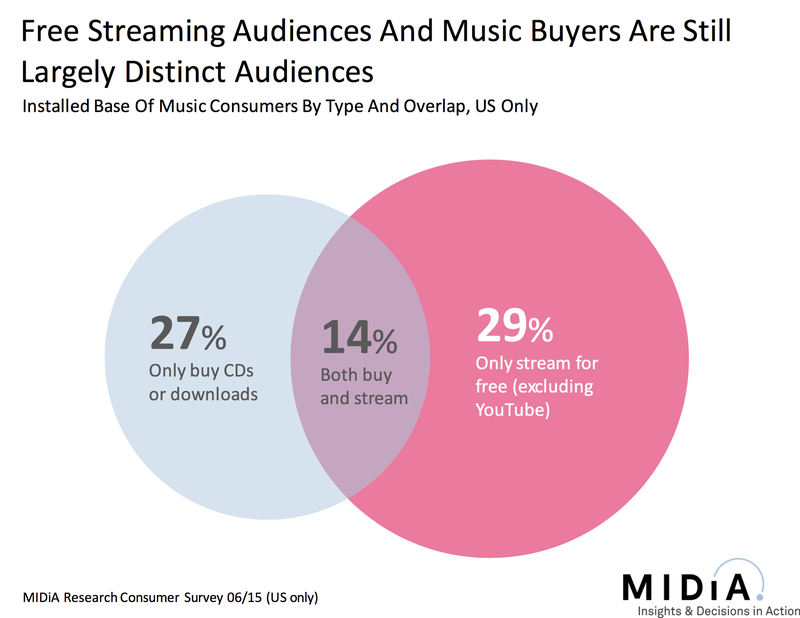 But the long view shows us that licensed streaming music will be ubiquitous five years from now, music sales will not. Even if Taylor Swift is still at the top of her game in 2019 she won’t be selling any 1 million albums anymore. Spotify though can’t wait five years for Swift to shake off her streaming inhibitions. It can however help itself by accepting that its free tier should be on a different release window from its paid tier. If it doesn’t it makes windowing a binary equation which in turn makes it easier for an entire blanket ban to be conceived. Of course the biggest irony in all this is that the free streaming services face no such blocks. All of Swift’s videos are still on YouTube and you can find her music all over Soundcloud, let alone Grooveshark. 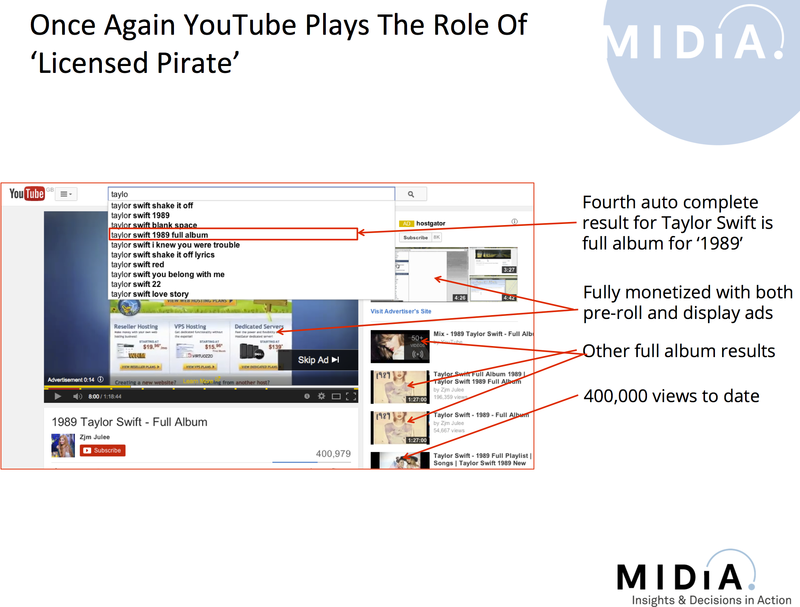 As MIDiA revealed last week, YouTube is one of the largest threats to music revenue. But because the music industry still views it as a marketing channel rather than a consumption channel it is measured by different standards. Thus 10 million YouTube views is a promotional success, whereas 10 million Spotify streams is x thousand lost sales. This hypocritical inconsistency has to end. Spotify premium customers are some of the most valuable music fans there are, most YouTube users are not. And both YouTube and Soundcloud also fail to crack down on blatant misuse of their platforms. As the screen grab above shows, YouTube makes it easier than easy to access the full ‘1989’ album, which in this instance is fully monetized and has 400,000 views. Meanwhile Soundcloud also has the full album, this time conveniently presented as individual tracks. And even if / when UMG catches up with these infringing files, not only will more pop up, YouTube also has this, a full ‘1989’ playlist, full of non-infringing, Vevo videos. The simple fact is that too much is given away for free on YouTube. If Big Machine and Taylor Swift are really worried about cannibalizing album sales, they should take a long hard look at their YouTube strategy before pulling their content from Spotify. UPDATE: UMG caught up with the 400,000 views full album YouTube video of ‘1989’ (that was quick) but the very same user has multiple other instances of the full ‘1989’ album which have hundreds of thousands of views and are still live. Beyoncé’s team will be rightly feeling pretty pleased with themselves right now, having created a massive buzz around her eponymously titled fifth studio album by deliberately creating absolutely no buzz whatsoever prior to its release on Friday 13th. By doing something a little different with digital they have managed to get swathes of media coverage, cutting through in a manner that could only be dreamed of with a traditional music marketing campaign. Showcasing a big digital gimmick is a reasonably well used trick by established artists wanting to cut through, whether that be Radiohead’s ‘In Rainbows’ pay what you like experiment or Daft Punk’s ‘Random Access Memories’ iTunes exclusive. There of course many serious permutations of the ‘Beyoncé’ release, both in terms of product strategy (e.g. the integration of video) as well as marketing (turning the traditional album build-up strategy on its head). But of most significance is what it says about the growing role of first week sales. Prior to the release of this album Beyoncé’s sales were in sharp decline, from a peak of 4.9 million US sales for ‘Dangerously in Love’ in 2003 to just 1.4 million for ‘4’ in 2011 (see figure). The total market decline in album sales was clearly a mitigating factor but the rate at which Top 10 US album sales declined over the same period – 50% – was significantly less than the 71% by which her album sales declined. Beyoncé’s team needed something clever to ensure that the latest album didn’t continue the downward trend. Doubling down on first week sales was a smart move. It combined the novelty of the tactic, the creation of a sense of scarcity by being an iTunes exclusive for one week and the ability to mobilize her core fans into buying in a concentrated manner and thus increase the odds of pushing the album to the number one spot on its debut full week. What unites Taylor Swift and Beyoncé is the growing importance of first week sales. Both are suffering declining album sales as a result of broader consumer trends, and both have concentrated ever larger proportions of sales into the first week of release. Consequently for Beyoncé first week sales volumes have increased by 89% while total sales declined by 71%. 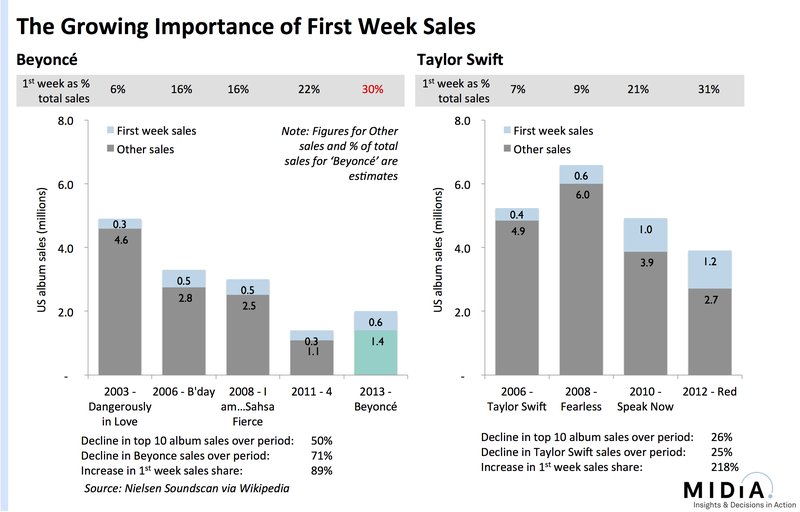 For Swift first week sales have increased by 218% while total sales fell by a quarter. Other artists have woken up to the importance of the first week sales springboard too, not least Daft Punk who secured first week sales of 339,000 for ‘Random Access Memories’ representing 44% of all US sales to date. By contrast their last album ‘Human After All’ sold just 127,000 in the US. As music sales continue to dwindle artists’ release teams have to get increasingly creative about how they get the most bang for their marketing buck. Expect the first week sales focus to sharpen even further now for frontline global scale artists.